After much sweat and tears, rather paper and paint, I finished a new layout, once again featuring my little guy. 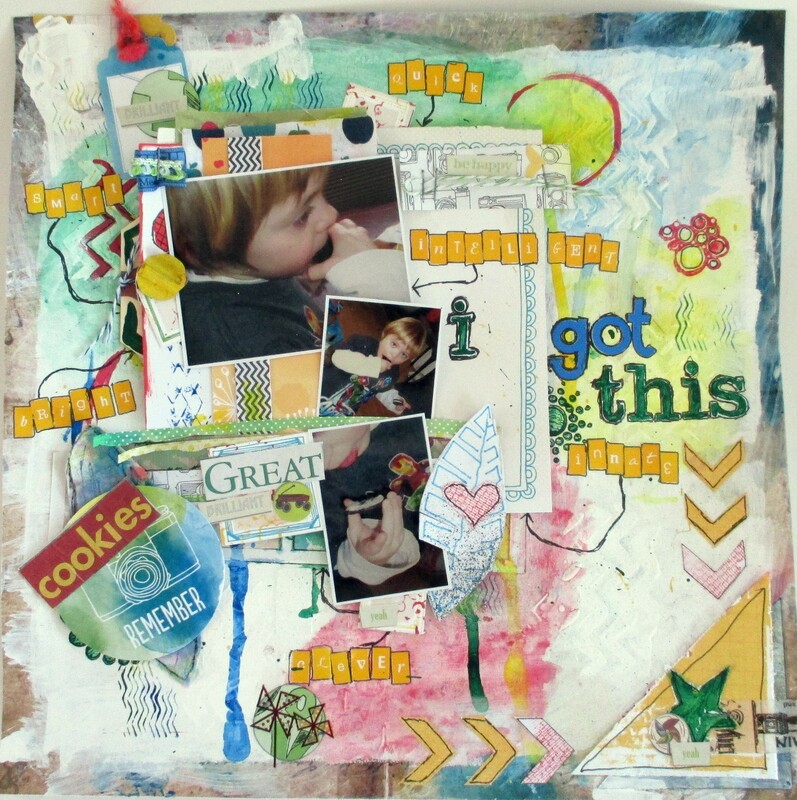 I’m entering this into both ScrapFriends Sketch Challenge #23 as well as the first collaboration between CSI and Archi-Scraps. Like a few of my projects lately, this started out as something else. 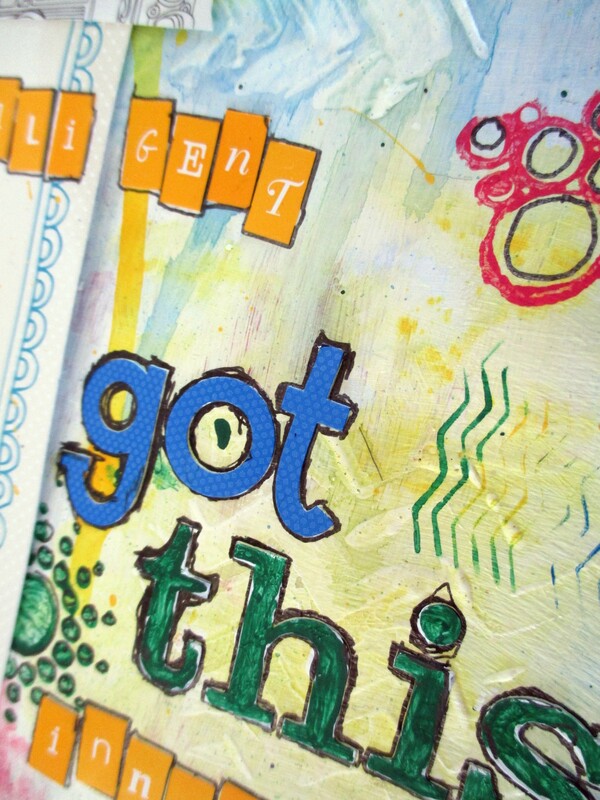 The background patterned paper is from DCWV Tattered Time, which looks like aged book paper. I sponged white paint over most of the background to start fresh, then painted the background in patches of watered down paint in different colors, making sure that they didn’t overlap. 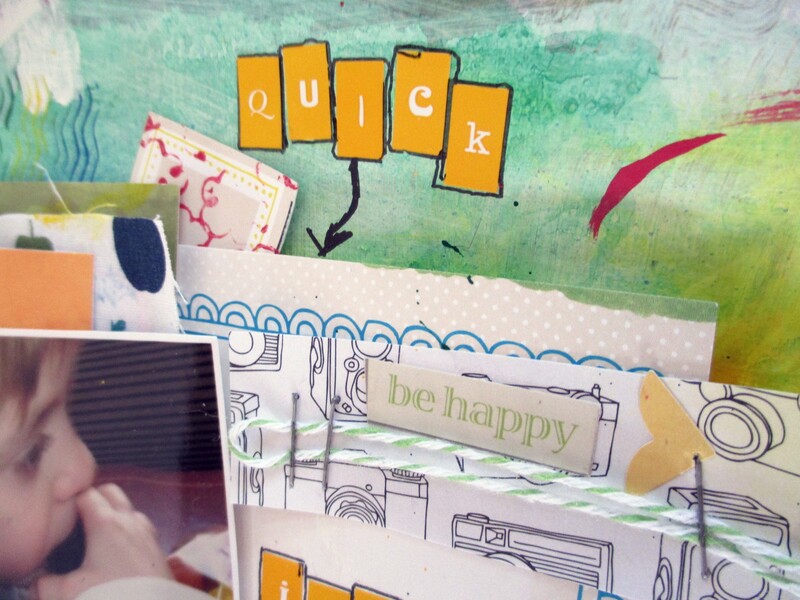 I also used gesso through chevron stencil to leave small zigzags around the page. I also used paint for a lot of other bits. I used watered down paint in mini misters to make paint spatters, as well as some freehand circles of color. I also stamped with paint using a circles Inkadinkado stamp set, and used green paint to coordinate part of my title to the color scheme. I used paper from Amy Tangerine, DCWV Far East and Rock Star, and We R Memory Keepers White Out, along with some fabric with an apple pattern. 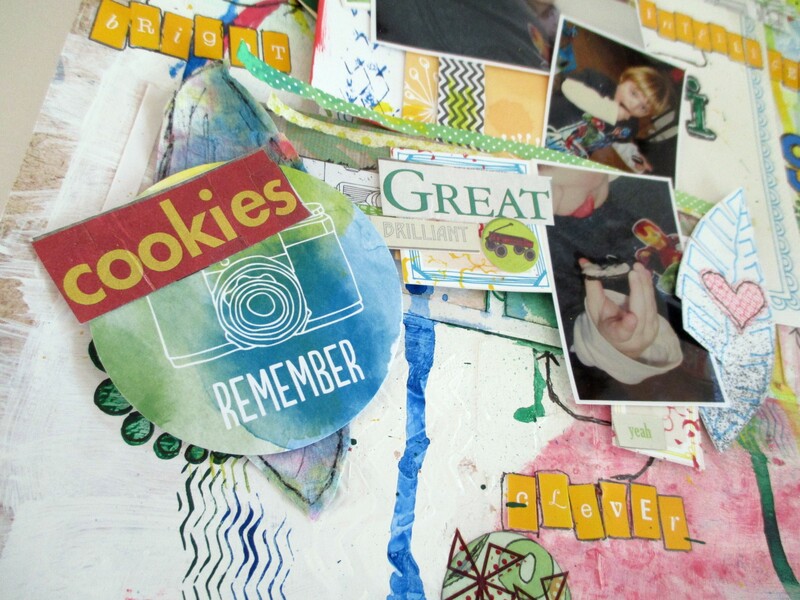 I cut out the words “cookies” and “great” from a sheet of patterned paper I got on clearance. 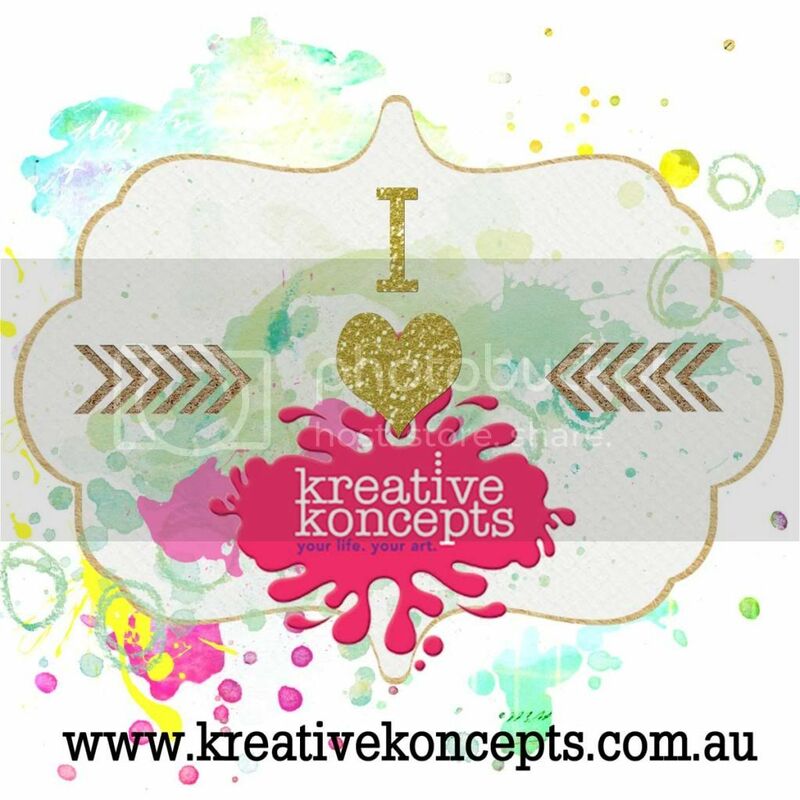 I used word ad shape bits and bobs from a K&Co. ephemera pack. I like using staples, so there’s a few on this layout too. 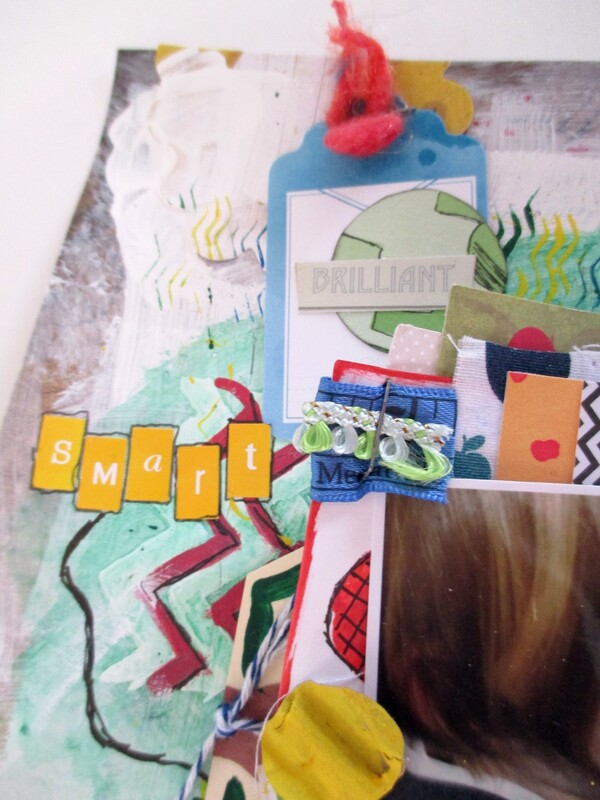 They’re awesome for holding clusters together and to the page. Here’s one where I added some tissue tape and then used gesso and paint to match the star sticker to the color scheme. Following the Visu-words cue from the Testimony, I used mini yellow letters for all the different words. The camera tag, as well as the small frame tag are from Amy Tangerine, while the heart and leaf die-cuts I made myself from my stash. the leaf/feather shape behind the AT tag I cut from a baby wipe I used to clean the paint off my stamps 🙂 I do my best to recycle my leftovers, heh. 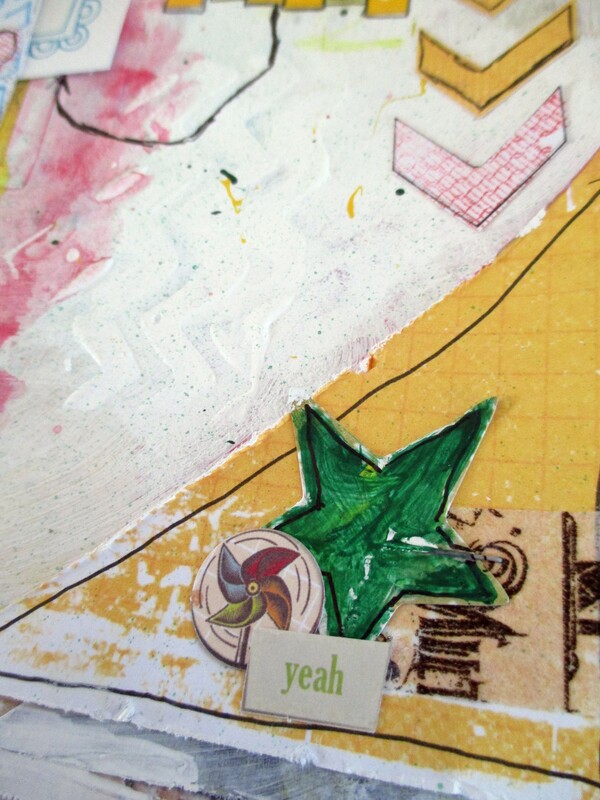 The green circle is old paper from my stash that I doodled on, then added a rub-on from my stash. I used my American Crafts 03 black pen to outline/doodle around a bunch of the elements, and I had fun with it. Several items in my Etsy shop need a refreshing. I’ve remade cards before, and you almost couldn’t recognize them. 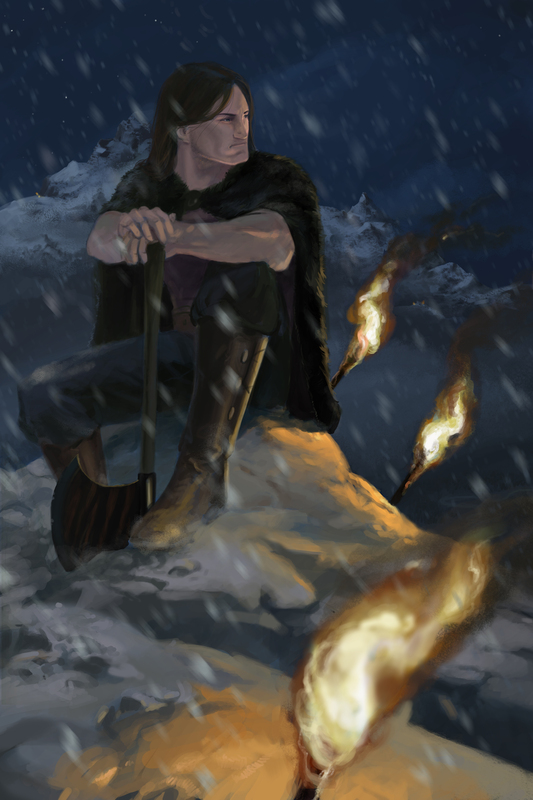 So here’s a sneak peek at another one that’s gotten a facelift. Some elements have stayed, but altered. 😛 I had fun playing with my gesso and Tim Holtz Distress Stain, as well as my Tattered Angels spray in black. The bird is a stamp image that I cut out of altered patterned paper, then, added the black pen and a touch of red and blue distress stain to help it match the card. I also used distress stain in the bottom flower layer (it was brown, but I made it a great shade of blue. So click the link and feast your eyes! And now to show some more love to my hubby. 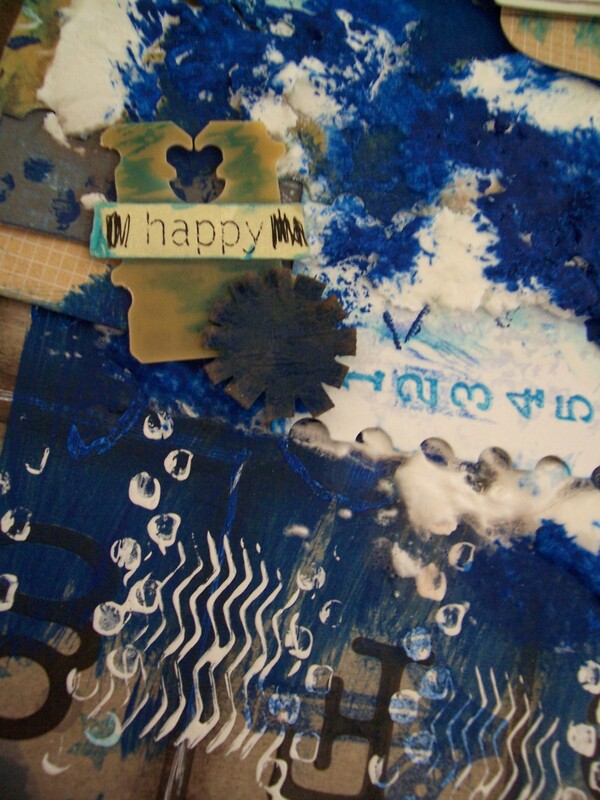 I love ScrapFriends blog, everything about them. The challenges are fun, their design team is super talented, and their tutorial posts and videos are so awesome! 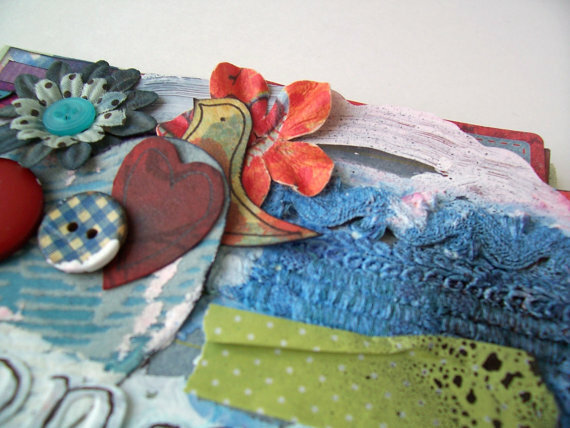 Anyway, that being said, I’ll admit to have a tough with the current ScrapFriends Colour Challenge. Not that I don’t like the colors, perse, but I’m not the hugest fan of brown. Kraft, I dig, but brown can turn me off at times (but I love chocoalte, go figure!). Thankfully, the design team did some awesome work and I was struggling to make the layout work. Then I saw Miae Rowe’s take on the colors. It reminded me that I can use the colors however I’d like. And her texture was so cool! So I started anew with different photos as well as Creative Scrapper’s Sketch Challenge, flipped the sketch, and got to work. 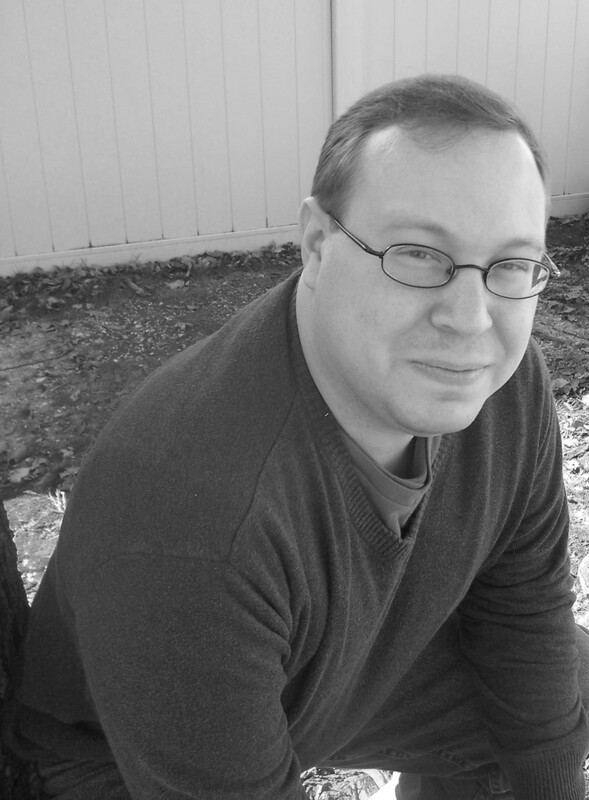 I love my hubby, I love his brain and how it works (fantasy writer, sword and sorcery type, check him out here). And I love movies, and the Russell Crowe and Jennifer Connelly movie A Beautiful Mind popped into my head, as did my homemade texture paste (recipe here). 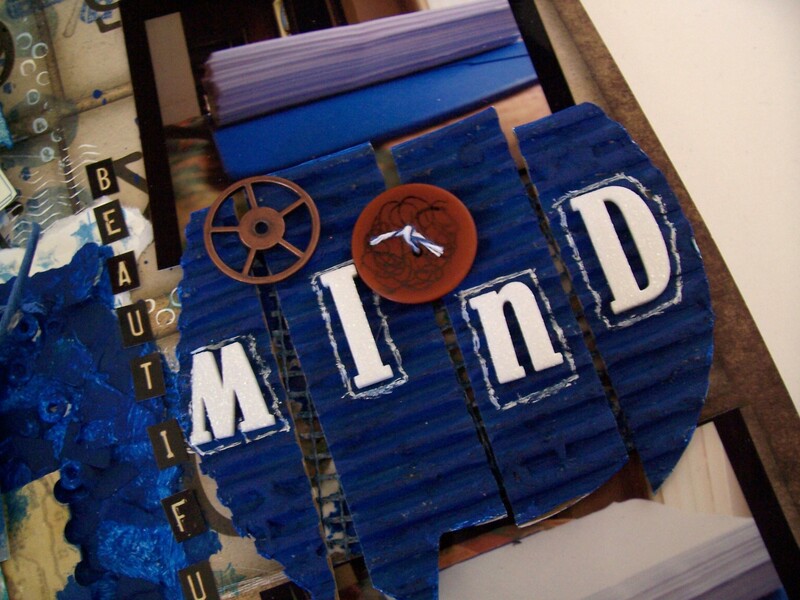 Now blue is hubby’s fave color, and the patterned paper (from DCWV Tattered Time) worked great. I like how the letters are upside down (complete accident, by the way), since hubby’s created his own world, so outside the box a little. 😀 I had already done a bunch of stamping with white paint and had my layers put together, so I snipped a little off to make them fit better on the layout. The ticket you see above is by Amy Tangerine (the changed the pink lines to black with a pen). 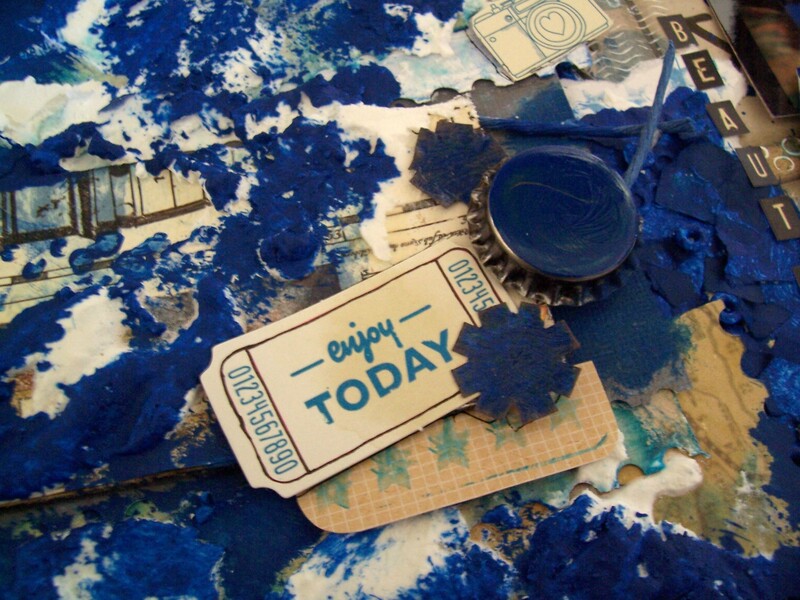 The bottle cap was plain, so I finger painted the top blue, and when dry, spread a little matte medium to seal it. I also wanted to use cogs and gears, but I don’t have many, nor a die-cut machine to make some. So, I improvised. It took awhile, but here’s what I did. I grabbed some paper flowers and cut all the petals to cog length, then snipped the sides to make them look more cog-ish 😛 Then I painted them with blue paint and edged them with ColorBox brown ink for a worn look before covering them with some mod podge. Once dry, I added a touch more brown and I had 3 small cogs to add! The tag you see above is from a loaf of bread, with a “masking tape” word sticker and some pen outlining. I had also stamped onto packing from K&Co. and cut out the images as tabs that I spread around my layout. I used foam white glitter alphas and small alphas from Simple Stories Destinations line, and outlined the foam letters with my white pen. The corrugated cardboard has also had an interesting trip. Leftover from another project, I ended up with a big quote shape. After playing with different techniques and mediums, I painted the whole piece blue with a white outline, then cut it into strips, one for each letter. You might also be able to see the layers underneath. 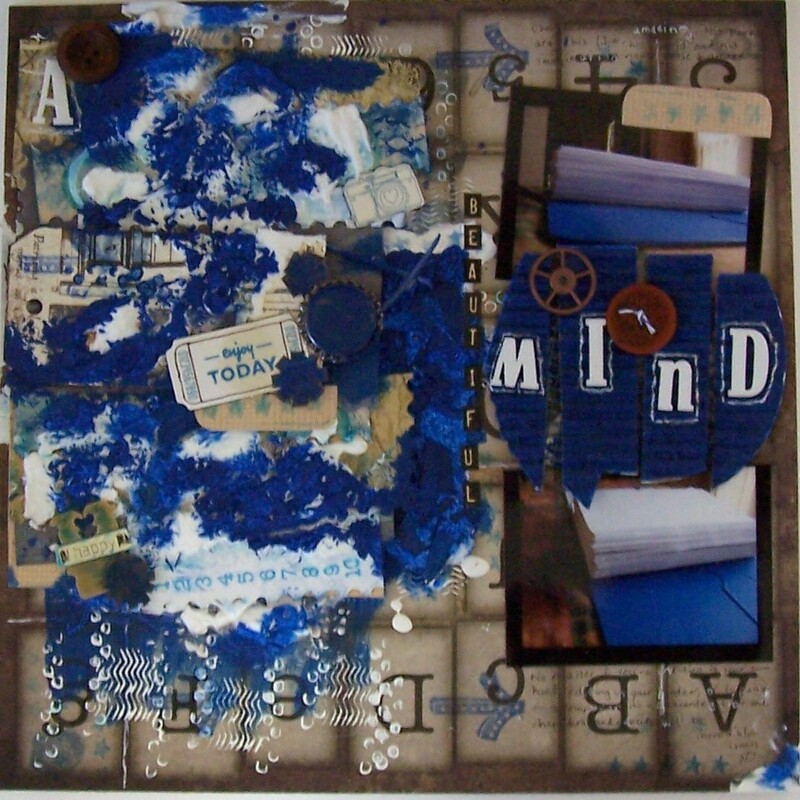 More texture paste, blue paint, and silver magic mesh that I coated with matte medium, then went over with my Tim Holtz Distress Ink stamp pad in denim. There’s also some blue pen doodling on the brown button. My journaling is on above and below the photos, which are of my hubby’s giant binder that he uses for editing. Now you can’t read anything in the photos, and yes that’s intentional. Anyway, enjoy and happy scrapping!